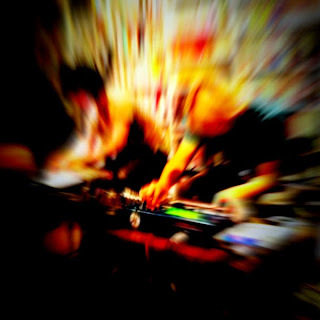 Live recordings of improvised "Silent Disco" by Tohru Fujimura & Toshiyuki Yasuda, using electronic instruments. Tohru Fujimura - Produced for an animation movie "Ex Machina" (Music supervised by Haruomi Hosono), the Netherlandish label "TEAMrecords".. Released his first solo album "mild blue tone" in July 2010. Toshiyuki Yasuda - Ex-member of FPM. Working with Towa Tei、Señor Coconut、Jazztronik.. Acting uniquely like singing Brazilian music as a fictitious robot "ROBO*BRAZILEIRA". The EP is a live recording of "Silent Disco" performed by the two musicians at Slow Comedy Factory on 2010.7.25. Silent Disco is a peculiar DJ/live format that an audience listens to music with their headphones, originated a Finnish SF movie "Time of Roses" and became popular using by eco-activists in 1990's. This time the two did improvisation using electronic instruments. Instead of PC, they synchronized hardware instruments, programmed in real time and roused gradually and thrillingly. The performance is based on acid dance music and abstract synth and noise contrast with organic sounds like steel pan. One of the audience said that "it was like a zoo of the sounds." so species names are used in titles. Packaged "Non Edit" versions (a little less that 40 minutes, purely as they are played) and "Short Edit" versions (shortened to easy lengths) respectively.